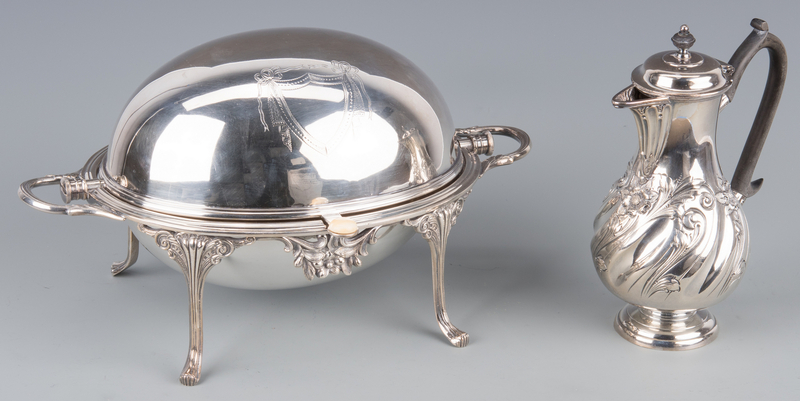 Group of English silverplated hollowware, Victorian-Edwardian period. 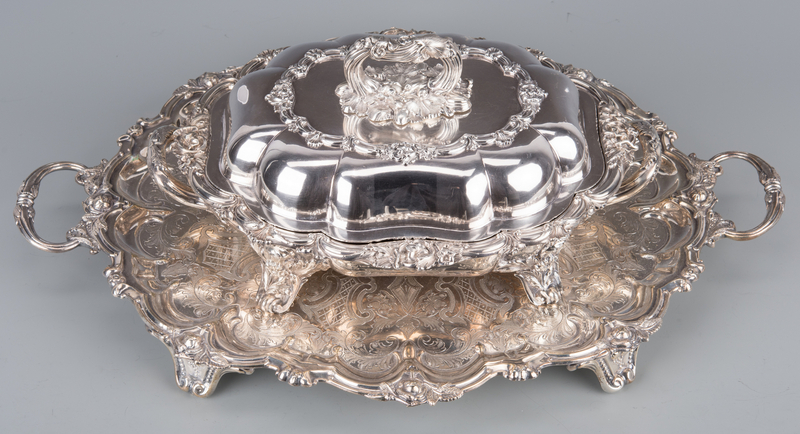 1st item: English revolving breakfast server, oval domed form with engraved shield cartouche at center of top (no monogram), cast swag decoration and reeded scroll and paw feet, two removable pans inside. Maker's mark JR & S on bottom. 8 1/2" H x 15" W x 10" D. Ivory knob has become detached but is retained. 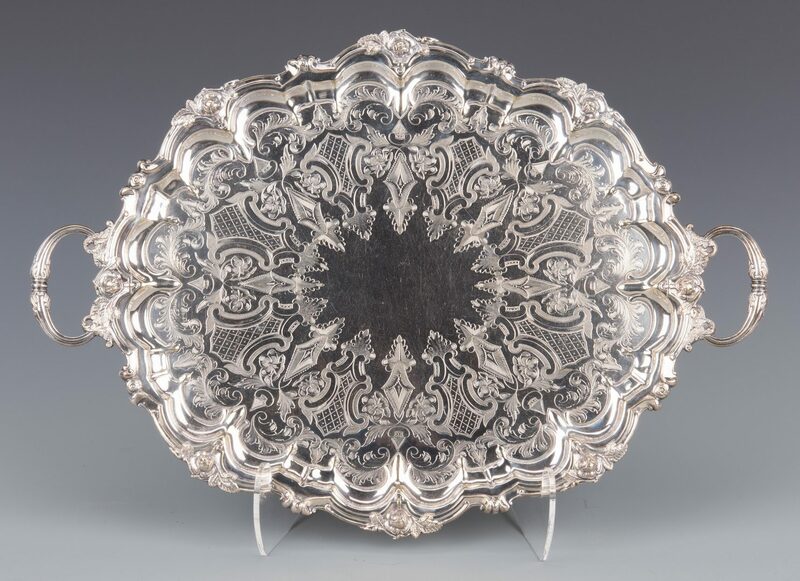 2nd item: Silverplated waiter tray with oval lobed sides having elaborately cast fruit, floral and buckle decoration; engraved flower and shield design to center. Two side handles and four bead, scroll and flower decorated feet. Marked EPNS on back, no maker's mark. 22 5/8" x 16" overall. Excellent condition, likely replated. 3rd item: Rococo style coffee pot, pear shape with diagonal lobed and floral repousse decoration, ebonized handle and finial. Marked EPBM with horn and banner mark, "Unbreakable Handle", and other illegible marks. 9 1/4" H. Handle slightly loose. 4th item: Entree warming dish server, oval lobed and footed form with finely cast floral and scroll decoration at top handle (removable) and side handles, edges, and feet. Removable center section. Engraved griffin crest. Marks for Smith, Sissons & Co. 7 1/2" H x 14" W x 9" D. One corner of lid slightly bent, some scratching to lid to left of crest. Overall very good condition. 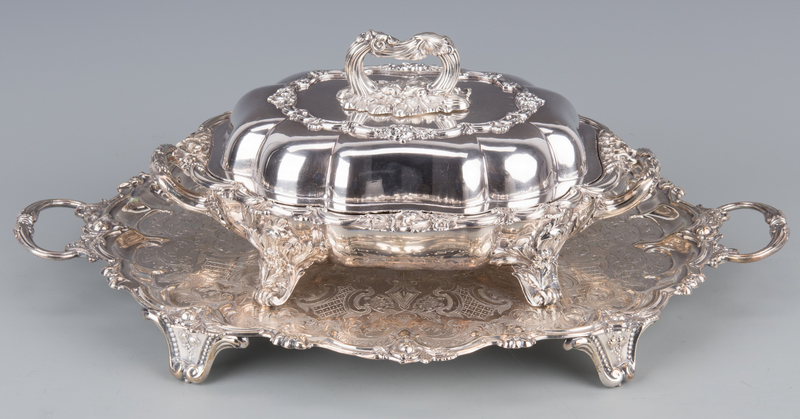 5th item: Entree dish, rectangular form with gadrooned edges and beaded oval handle, marked on bottom Mappin & Webb Princess Plate. 6 1/2" H x 11" W x 8 1/2" D. Light wear to underside, top in very good condition. CONDITION: See item description.